Under the latest stage of a £2 million investment programme, Concentric Pumps Limited has installed two new horizontal machining centers to cope with increased demand for diesel engine fuel pumps at its UK plant in Birmingham. The two new machines are both Mori Seki NH4000 DCG™ high-precision horizontal machining centres, incorporating innovative DCG™ (Driven at the Centre of Gravity) technology. Investment in the whole project totaled approximately £0.5 million. The DCG™ system makes possible rapid acceleration and deceleration whilst maintaining stability to ensure high surface quality. This is achieved by a design that transmits energy to the centre of the spindle and table, allowing optimum power to be applied without creating vibration when the workpieces and tools on the spindle move. Increasing the forward feed acceleration does not adversely affect precision and actually improves surface quality and tool life. Concentric is expecting the new machines to reduce cycle time for fuel pumps by around 15%, enabling an additional 105 pumps to be produced per week, per machine. Maximum spindle speed of the NV4000 DCG™ is 14,000 (20,000)min-1, with a BT40 tool shank. The table allows a maximum workpiece swing diameter of 630mm (24.8ins) and a maximum workpiece height of 900mm (35.4ins). X-axis travel, by longitudinal movement of the saddle, is 560mm (22.0ins) and Y-axis travel, by vertical movement of the spindle head, is the same, whilst Z-axis travel, by cross movement of the table, is 630mm (24.8ins). 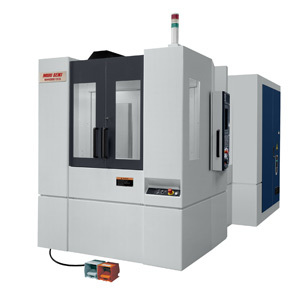 The machines were supplied to Concentric by Frederick Pollard & Co. Ltd. of Leicester, which specializes in the supply and manufacture of high quality, high precision machine tools and workholding equipment. Concentric Pumps Limited is a subsidiary of Concentric plc, a major supplier to the world's, truck and construction equipment industries with plants in India and the USA as well as the UK. In addition to oil and water pumps for diesel engines, the company also manufactures lubrication pumps for transmissions and compressors.